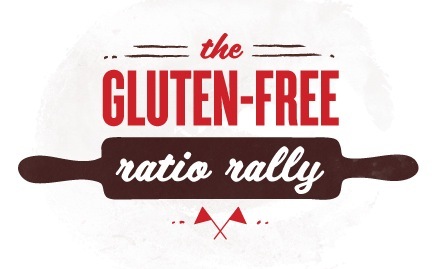 Yesterday may have been May Day, but today is Gluten-Free Ratio Rally Day! It’s that time of the month when we join with other bloggers to share the results of a themed challenge we’ve been tackling for the last month. As you can see, this month’s theme was bagels, a subject near and dear to yours truly. Creating an authentic boiled-then-baked Long Island bagel was something of a personal mission. It was one year ago—almost to the day—that we first posted our recipe here on the blog. Since then, we’ve taught how to make those bagels at the Gluten- and Allergen-Free Expo in Dallas and Chicago. And a similar recipe for Long Island bagels is included in the forthcoming second edition of our first cookbook, Artisanal Gluten-Free Cooking. When it came to this month’s ratio rally, we once again—as we’ve done before—used the opportunity to challenge ourselves and push the recipe into new territory (at least for us). What does that mean in practice? 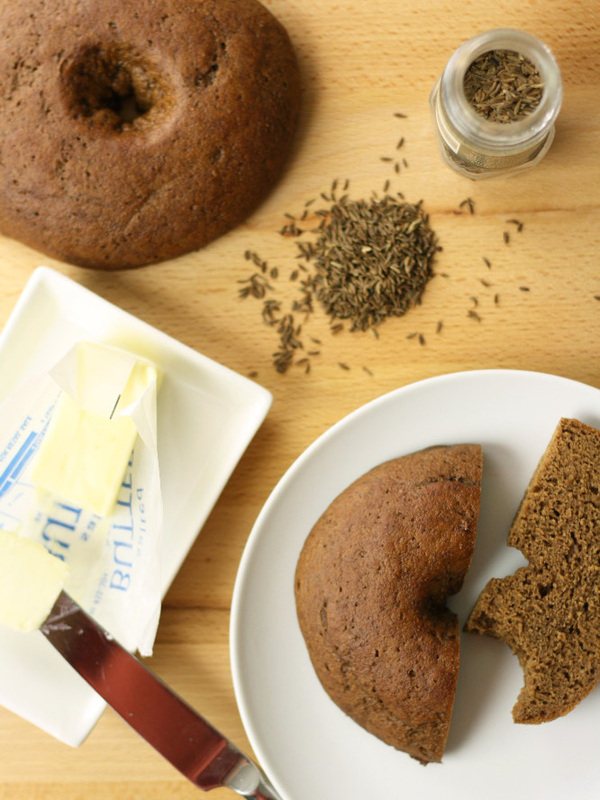 For bagels, it means we’ve come up with a delectable faux pumpernickel. Pumpernickel breads are often dark, and true pumpernickel is made using rye flour (one of the forbidden flours if you’re gluten-free). 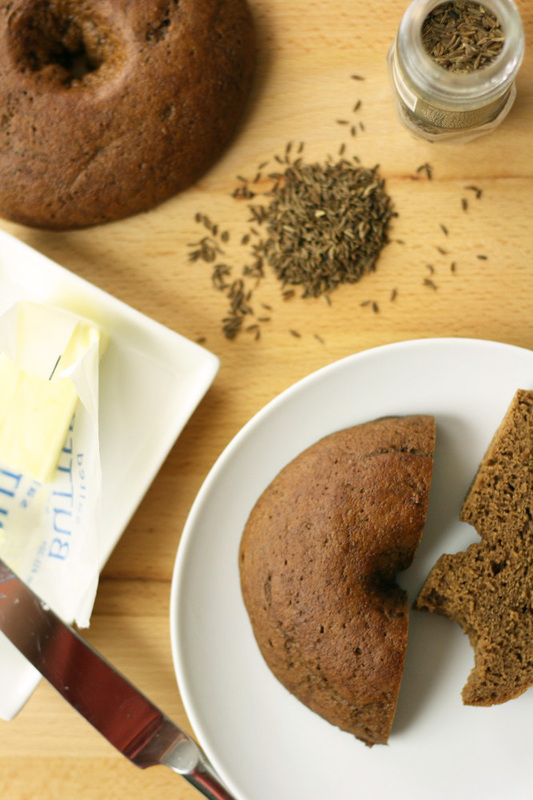 North American-style pumpernickel breads often use a combination of wheat flour and rye flour, and also frequently incorporate cocoa powder, coffee, molasses, and/or caraway seeds. For our version, we bet the farm and used cocoa powder, coffee, molasses, dark brown sugar, and caraway seeds. And the result? A moist, soft, chewy, tender bagel with a rich, balanced flavor that closely mirrors the pumpernickel of our memory. But you can decide for yourself. 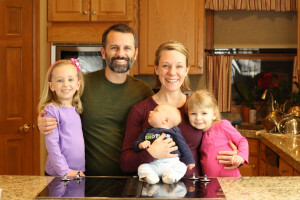 And if you’re looking for some extra bagel love this month, be sure to head over and visit Meals with Morri, this month’s Ratio Rally host. There you’ll find links to recipes for blueberry oat, sundried tomato parmesan, cinnamon raisin, and other delightful bagel recipes. 1. In the bowl of a stand mixer, dissolve the sugar in the warm water, then add the yeast and let sit at least 5 minutes, until the yeast is well active. 2. Meanwhile, place a 9×9 baking pan (or similar) on the bottom rack of your oven, and bring a teakettle of water to a boil, then turn off the heat. 3. Add the egg whites, molasses, and instant coffee to the stand mixer, and using the paddle attachment, mix at medium-high speed until the coffee crystals are dissolved. 4. In a separate bowl, combine 125g (1 cup) flour, salt, xanthan gum, cocoa powder, and dark brown sugar, and whisk to mix well. 5. Add to the stand mixer and mix at medium speed until well-incorporated. Scrape down the sides of the bowl with a spatula if needed. 6. Add another 125g (1 cup) flour to the stand mixer, and again mix until well-incorporated. 7. Switch to the dough hook for your stand mixer. Add the caraway seeds, plus the remaining 100g (3/4 cup plus) flour, and mix until well-incorporated. 8. Drizzle the dough liberally with olive oil, toss to coat fully, and turn the dough out onto a smooth work surface. The dough will be very wet, on the verge of sticky. 9. Cut the dough into quarters. Coat your hands with a bit of olive oil, then roll each dough quarter into a smooth ball, like you’re making a meatball. 10. Place the dough balls on a greased baking sheet, and pat them down to make thick hockey pucks. 11. Dip your index finger in olive oil, then punch down through the center of each hockey puck. Keeping your finger in contact with the baking sheet beneath, swirl it in a circular motion to enlarge the hole in the center of each bagel. 12. Place the bagels on the center rack of your oven, pour the teakettle of hot water into the baking pan, and shut the oven door. Let rise (no peeking!) for 45 minutes. 13. Remove the bagels from the oven, preheat the oven to 400 deg F, and bring a deep skillet of water to a boil on your stovetop. Season the water with 4 to 6 tbsp of sugar. 14. When your oven is to temperature, flash bake the bagels for 5 minutes. Then boil them for 2 minutes per side. 15. Return the bagels to the oven and bake for an additional 20 minutes. If you find the dough too difficult to work with, add additional flour 1 tbsp at a time, until you’re comfortable. As written in this recipe, the dough is on the verge of too wet to hold the rise—our bagels spread a bit, in addition to puffing up, during the rise. To combat this, we may add a smidgen more flour next time, though we were very happy with the final texture on this version. This recipe is: gluten-free, dairy/lactose/casein-free, peanut-free, tree-nut-free, fish-free, shellfish-free, soy-free, vegetarian. Per bagel: 375 calories, 2g fat, 80g carbs, 15g protein, 12g dietary fiber, 8g sugars. these sound delicious… great job, you two! These look amazing, you guys. Beautifully done. Yum! These look great! Can’t wait to try these. I do miss some good pumpernickel! 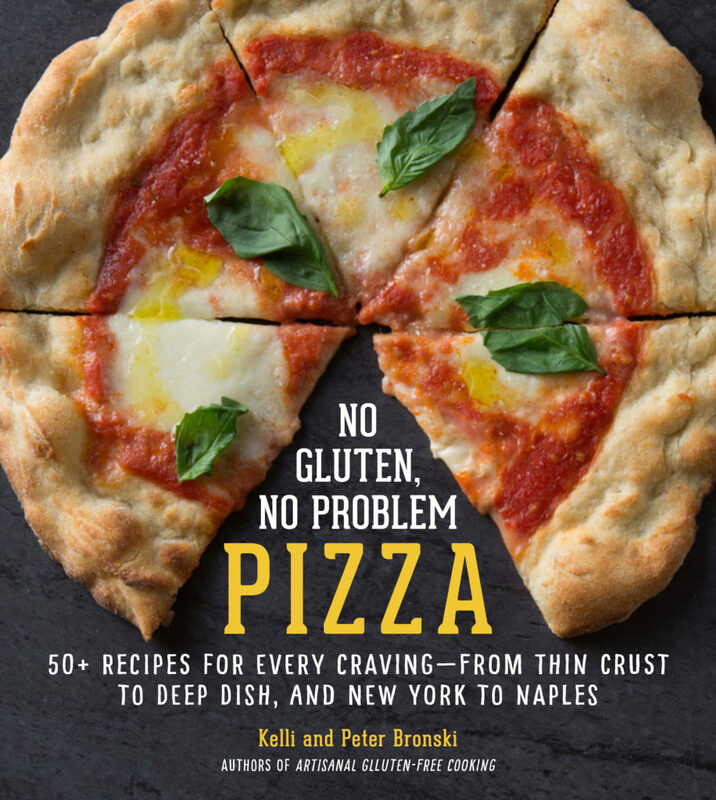 Wow, a gluten free pumpernickel version! These bagels have GOT to be awesome!! Thanks! The flavor and texture was fabulous. Really good pumpernickel. But next time we’d definitely tweak the ratio further to yield a drier dough that’ll rise better. These were a little flatter than we’d otherwise like. Maybe another 20-25g flour or so would do it, I’m guessing. Oh my! You have my mouth watering… and I can just taste these beauties toasted with cream cheese and orange marmalade… mmmmmmmmm. Hi Heather, Mrs. R, and Shirley… Thanks for your compliments, and enjoy the bagels! Hi Tanja… Good idea making a loaf of bread first. Enjoy!